Bad Gastein is a spa town in Austria, situated in the middle of the National Park Hohe Tauern, at 1,000 metres above sea level. It hosted the Alpine ski world championship in 1958. It is located at the head of the Gastein valley, within the state of Salzburg, in which Salzburg is the major city. Dorfgastein is a neighbouring town in very much the same style. All three areas are located very close together and accessible within 10 minutes via a shuttle bus ride. It should be noted that all the bus services are provided free of charge to skiers. The actual ski runs are mainly blues and reds/hard reds with only 1 black run, this however was perfect for the group of friends that we shared the trip with. Most were intermediates with a couple of total beginners. The beginners in our group went to the "Inter Ski" Ski School for lessons and most of the instructors seemed very nice and informative, however our beginners got an instructor who was surely, unhelpful and worst of all seemed unable to spot what people were doing wrong an offer guidance and help. So much so that the beginners refused to go on the second day and preferred to "take their chances" on their own. Fortunately the expert amongst our group very generously offered to tutor them for the day. Not the best start I'll admit, but after the first hour one of the beginners commented "I've learned more in 30 minutes today than I did all day yesterday". After the second day the beginners were up and blasting down the blues with renewed enthusiasm and confidence. 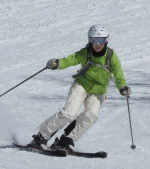 The lesson here, well just because you are a good skier and have the position of Ski instructor it does not necessarily make you a good teacher. The three areas are made for us guys/gals, but with plenty to push us should we need a little more excitement. The whole group stuck to piste skiing and 100% of all the piste areas were groomed every night making the skiing surfaces perfect every day. There was a great mixture if long, wide winding slopes, moguls and steeper heavier going slopes with great terrain features to stretch our skiing. Out of the 3 areas I much preferred the Dorfgastein area, the diversity just seems a little better and the blues where a little more "beginner freindly" so the trouble and strife (wife) was happier. - got to get your priorities right eh lads. Having said that Bad Hofgastein did hold the one of the best runs I've ever had the good fortune to Ski on: A red run that is 14.6km in length! nick named "The Annihilator" by the locals. When pressed a local Skier suggested that "anyone who could not ski it from top to bottom without a stopping was a ****". Sadly all of our party failed the challenge and were indeed pussies ? Badhofgastein has quite a lively night life with a couple of late night Disco bar type setups if that?s what floats your boat, being a bit older our group tended to have a few beer and hit the Spa area for a good soak and sauna to revive our tired muscles. The area was abundant with traditional eating establishments, all of very high quality; operated by very friendly and considerate people. The dark side: Austrians/German and buses. Rather than trying to bring my own views into the arena and risk a tirade of abuse from people disagreeing with my analysis of situation, I propose to list a factual event and let you decide. After a great day long ski-fest at Dorfgastein our party had a quick beer and then moved to the shuttle bus area. We were a bit early and amongst the first to arrive. The following ten minutes produced a large crowd around the bus stop area all obviously waiting for the same bus. This was our first return trip (previous days were spent at Badhofgastein and as such no bus trip was necessary). Five minutes later the bus pulled into the station and as soon as it came to a full stop the waiting crowd just suddenly charged the bus! People at the front of the crowd were physically slammed against the side of the bus (our party amongst them). The bus doors opened and the people inside just stood there as there was physically no free space in which to step off the bus into. The crowd did not budge. After 30 - 40 seconds an older German/Austrian started shouting at a woman at the front of the queue trying to get out of the doors, she retorted obviously trying to explain she could not move. The older man the proceeded to drag the woman off the bus into the crowd, her skis and poles were dropped on the floor. Once she had been dragged off a small gap opened up for the other passengers to leave the bus, they did so whilst being jostled and one older man fell to the floor. People just trampled over him as he lay on the floor signalling for assistance. Once on the bus (our party all managed to get seats) a German woman motioned at a member of our party to give up their seat for her elderly husband, giving the reason that he was not good on his feet, very old and unstable. Being and Englishman the member of our party immediately started to move... but wait, it suddenly dawned on him that the "Elderly" man was in fact in full ski clothing included boots, skis and poles etc. This "Elderly" man had in fact managed a full days skiing on a 2,000m mountain but could not stand on a bus for a 10 minutes journey! Needless to say the member of our party immediately say back down. Every other return bus trip was much the same (although not quite as harsh as the first). All in all a great skiing trip in a great area with no bad days or injuries at all. Highly recommended for intermediate/low advanced skiers with one exception (read the dark side above). I could not recommend the area for children though and no consideration is made for them by bullying adults. They are treated in the same fashion and often physically forced out of the way. I don't know if I would go there again and am leaning towards France, Italy and Andorra. This is my first Ski review; I am not a professional writer and hope you will forgive the amateurish style and presentation. Interesting review and thank you for taking the time and effort to put your experience in writing. Very interesting that in some countries the "queue" is a law unto itself and in others, an opportunity to practice"me first" mentality. Given the weak dollar, any european ski trips are a dream only, so please continue to share your adventures with us over the pond!